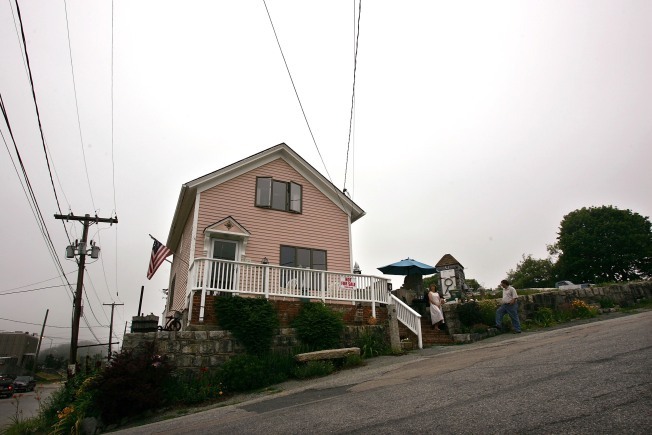 The fate of the iconic pink house of Susette Kelo was decided by the U.S. Supreme Court, but now four years later, it's gone and nothing's replaced it. Susette Kelo's home no longer stands here in New London. And after all that time, nothing's taken its place. Proponents of the ambitious plan blame the sour economy. Opponents call it a "poetic justice." "They are getting what they deserve. They are going to get nothing," said Susette Kelo, the lead plaintiff in the landmark property rights case. "I don't think this is what the United States Supreme Court justices had in mind when they made this decision." Kelo's iconic pink home sat for more than a century on that currently empty lot, just steps away from Connecticut's quaint but economically distressed Long Island Sound waterfront. Shortly after she moved in, in 1997, her house became ground zero in the nation's best-known land rights catfight. New London officials decided they needed Kelo's land and the surrounding 90 acres for a multimillion-dollar private development that included residential, hotel conference, research and development space and a new state park that would compliment a new $350 million Pfizer pharmaceutical research facility. Kelo and six other homeowners fought for years, all the way to the U.S. Supreme Court. In 2005, justices voted 5-4 against them, giving cities across the country the right to use eminent domain to take property for private development. The decision was sharply criticized and created grassroots backlash. Forty states quickly passed new, protective rules and regulations, according to the National Conference of State Legislatures. Some protesters even tried to turn the tables on now-retired Justice David Souter, trying unsuccessfully in 2006 to take his New Hampshire home by eminent domain to build an inn. In New London the city's prized economic development plan has fallen apart as the economy crumbled. In July, backers halted fundraising for the project's crown jewel, a proposed $60 million, 60,000-square-foot Coast Guard museum. The poor economy meant that donations weren't "keeping pace with expenses," said Coast Guard Foundation president Anne Brengle. The group hopes to resume fundraising in the future, she said. Overall, proponents say about two-thirds of the 90-acre site is developed, in part because of a 16-acre, $25 million state park. The other third of the land remains without the promised residential housing, office buildings, shops and hotel/conference center facility. "If there had been no litigation, which took years to work its way through (the court system), then a substantial portion of this project would be constructed by now," said John Brooks, executive director of the New London Development Corp. "But we are victims of the economic cycle, and there is nothing we can do about that." A new engineering tenant is moving into one of the office buildings at 1 Chelsea St., and a bio tech firm with as many as five employees is getting ready to move into an existing building on Howard Street, Brooks said. Kelo, paid $442,000 by the state for her old property, now lives across the Thames River in Groton, in a white, two-bedroom 1950s bungalow. Her beloved pink house was sold for a dollar and moved less than two miles away, where a local preservationist has refurbished it. Kelo can see her old neighborhood from her new home, but she finds the view too painful to bear. "Everything is different, but everything is like still the same," said Kelo, who works two jobs and has largely maintained a low profile since moving away. "You still have life to deal with every day of the week. I just don't have eminent domain to deal with every day of the week, even after I ate, slept and breathed it for 10 years." Although her side lost, Kelo said she sees the wider ramifications of her property rights battle. "In the end it was seven of us who fought like wild animals to save what we had," she said. "I think that though we ultimately didn't win for ourselves, it has brought attention to what they did to us, and if it can make it better for some other people so they don't lose their homes to a Dunkin' Donuts or a Wal-Mart, I think we did some good." Scott Bullock, senior attorney for the Institute for Justice, argued Kelo's case before the Supreme Court. He calls "massive changes that have happened in the law and in the public consciousness" the "real legacy" of Kelo and the other plaintiffs. The empty land means the city won a "hollow victory," he said. "What cities should take from this is to run fleeing from what New London did and do economic development that is market-driven and incorporate properties of folks who are truly committed to their neighborhood and simply want to be a part of what happens," he said.